Clones BM8 and CI:A3-1 recognise the F4/80 antigen, a 120-160 kDa glycoprotein containing seven EGF-like domains at the N-terminus, an RGD (Arg-Gly-Asp) integrin binding motif and significant homology to the transmembrane 7 (Tm7) hormone receptor family at the C-terminus. The molecular structure suggests multiple ligands. Possibly, F4/80 is involved in macrophage adhesion within certain tissues, combined with receptor signaling following peptide-ligand interaction. The antigen is expressed by most macrophages and macrophage precursors beyond M-CFC and increases upon maturation. 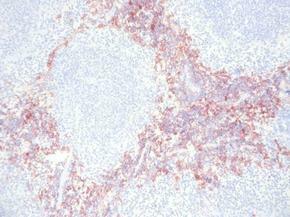 F4/80 is widely used for the detection of tissue macrophages. Activated macrophages and eosinophils express low levels. Schaller et al. 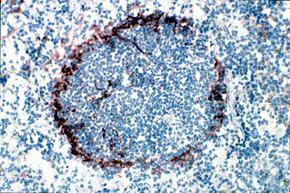 (2002) showed that BM8 antibody is the only macrophage marker that is able to distinguish non-destructive from destructive inflammation processes in the pancreas and has been shown to be a unique histological marker of the progression from peri-insulitis to ß-cell destruction and diabetes in a mouse diabetes model. The clone MOMA-1 and MOMA-2 are widely used mouse macrophage subpopulation markers. MOMA-1 (CD169) is a useful marker for the identification of macrophage subpopulations in various organs, mostly characterised by a high level of non-specific esterase expression. The staining is particularly noteworthy with the metallophilic macrophages adjacent to the marginal zone of the spleen. The marker is also very suitable for diffe-rentiation of non-metallophilic marginal zone macrophages as detected by ER-TR9. In addition, MOMA-1 detects macrophages at inflammatory sites and is po-sitive with Kupffer cells. MOMA-2 is a useful marker for the broad detection of monocytes and macrophages in all mouse strains. In combination with the anti F4/80 markers BM8 or Cl:A3-1 it allows a precise characterisation of tissue fixed macrophages in various organs. 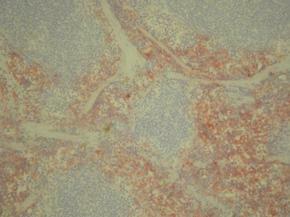 The antibody stains a mature macrophage subset, monocytes and a few precursors in bone marrow. Dendritic cells show low to intermediate expression. MOMA-2 is predominantly expressed in the cytoplasm, but is also present on the cell surface. The major drawback of both clones is that they cannot be used on paraffin sections like BM8 or Cl:A3-1. ER-MP20 antibody is useful for the detection of macrophage precursor cells in the mid-stage development stage (Ly-6C, late CFU-M, monoblasts and monocytes) (s. Fig.5.). It is highly suitable for the detection of monocytes in bone marrow samples by FACS. ER-MP20 also identifies activated macrophages in inflammatory tissues where the simultaneous use of the murine pan-macrophage marker BM8 (anti F4/80) is recommended. 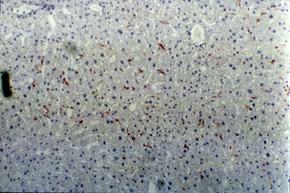 ER-MP20 antibody also detects a wide range of endothelial cells. Macrosialin is a heavily glycosylated transmembrane protein of 87-115 kDa, which is specifically expressed by tissue macrophages, Langerhans cells and at low levels by dendritic cells. 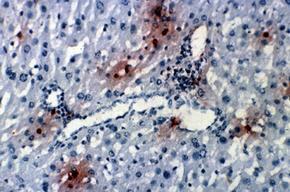 Macrosialin is the murine homologue of the human macrophage glycoprotein CD68. Both are members of the lysosomal-associated membrane protein (lamp) family which are located predominantly within the cells and can be detected by flow cytometry using cell permeabilisation. CD68 antibody clone FA-11 detects surface macrosialin at low levels in resident mouse peritoneal macrophages which can be enhanced with thioglycolate stimulation. It is the optimal tool for detection of cells of the macrophage/monocyte lineage by flow cytometry and is available with different labels. 1) Michael Torzewski et al. : Reduced in vivo aortic uptake of radiolabeled oxidation-specific antibodies reflects changes in plaque composition consistent with plaque stabilization. Arterioscler Thromb Vasc Biol, Dec 2004; 24: 2307-2312. 1), 2) Hiroe Kakehashi et al. : Differential regulation of the nature and functions of dendritic cells and macrophages by cathepsin E.
J Immunol, Nov 2007; 179: 5728-5737. 1), 2) Hiroshi Kimura et al. : Distinctive localization and opposed roles of vasohibin-1 and vasohibin-2 in the regulation of angiogenesis. Blood, May 2009; 113: 4810-4818. 2) Cuzić S, Bosnar M, Kramarić MD, Ferencić Z, Marković D, Glojnarić I, et al. Claudin-3 and Clara cell 10 kDa protein as early signals of cigarette smoke-induced epithelial injury along alveolar ducts. Toxicol Pathol. 2012 Dec;40(8):1169-87. doi: 10.1177/0192623312448937. Epub 2012 Jun 1. PubMed PMID: 22659244. 3) Maren Luchtefeld et al. : Signal transducer of inflammation gp130 modulates atherosclerosis in mice and man. J Exp Med, Aug 2007; 204: 1935-1944. 3) Renate Schreiber et al. : Esterase 22 and beta-glucuronidase hydrolyze retinoids in mouse liver. J Lipid Res, Dec 2009; 50: 2514-2523. 3) Anne Saaristo et al. : Vascular endothelial growth factor-C accelerates diabetic wound healing. Am J Pathol, Sep 2006; 169: 1080-1087. 4) Alun C. Kirby et al. : SIGNR1-negative red pulp macrophages protect against acute streptococcal sepsis after Leishmania donovani-induced loss of marginal zone macrophages. Am J Pathol, Sep 2009; 175: 1107-1115. 5) D. Movita et al. : Kupffer cells express a unique combination of phenotypic and functional characteristics compared with splenic and peritoneal macrophages. J Leukoc Biol. Oct 2012; 92(4): 723-33. 5) de Andrés B, Cortegano I, Serrano N, del Rio B, Martín P, Gonzalo P, et al. A population of CD19highCD45R-/lowCD21low B lymphocytes poised for spontaneous secretion of IgG and IgA antibodies. J Immunol. 2007 Oct 15;179(8):5326-34. PubMed PMID: 17911619. 6) MF de Bruijn et al. : Distinct mouse bone marrow macrophage precursors identified by differential expression of ERMP12 and ER-MP20 antigens. 1) Schaller, E. et al. : Inactivation of the F4/80 glycoprotein in the mouse germ line. Mol Cell Biol, 2002; 22: 8035-43. 3) Kraal, G. et al. : Macrophages in T and B cell compartments and other tissue macrophages recognized by monoclonal antibody MOMA-2. Scand J Immunol, 1987; 26: 653-661.